Ancient Egypt had several creation myths. It was believed that the world began as a swirling watery chaos, called Nu. Out of the chaos came Atum, the sun god, also known as Ra (and represented by the Bennu bird). He created a hill on which to stand, later the site of a temple at Heliopolis, and then a mate. His children established a social order and became the parents of Geb, the earth and Nut, the sky. Geb and Nut gave birth to Osiris and Isis, Seth, Nephthys. Osiris became pharaoh and set about civilizing the world. He taught agriculture, animal husbandry and a code of law. Isis, his wife, ruled when Osiris was away. After his murder, by Seth, who lived in the desert, Isis found that Osiris' body had been placed in a chest, thrown into the Nile and come to rest on a mound with a tamarisk (also called erica). It was at Byblos in Syria. The bush grew into a great tree with the coffin embedded in its trunk. Seth found Osiris body and cut it into 14 pieces. Isis buried them in separate places and each became sacred. Osiris became ruler of the underworld and the Osiris Myth led to the making of sacred space. The elemental components were a boundary, a mound and a tree. Later sanctuaries had a sacred grove, a sacred lake and a house for the god (a temple) to whom the sanctuary was dedicated. Pharaohs, who were living gods, required sanctuaries in which they could be cared for after their bodily existence came to an end. Sanctuaries were not gardens in the modern sense (of a place for flowers and a barbecue) but they are gardens in the classical sense of a bounded outdoor space with earth and plants. It is likely that the space, selected for symbolic and scenic reasons, was sacred before it was bounded. 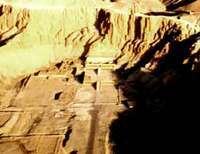 Aerial view of the temples of Mentuhotep and Hatshepsut at Dier el Bahri. One creation myth held that life began when a mound emerged from the Nile and the sacred Bennu bird landed. The mound was called ben-ben. The bird became the phoenix of Greek mythology..